For other people named Benjamin Orr, see Benjamin Orr (disambiguation). 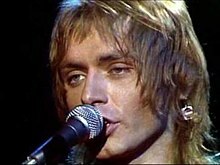 Benjamin Orzechowski (September 8, 1947 – October 4, 2000), known professionally as Benjamin Orr, was an American musician best known as a singer, bassist and co-founder of the rock band the Cars. He sang lead vocals on several of their best known songs, including "Just What I Needed", "Let's Go" and "Drive". He also scored a moderate solo hit with "Stay the Night." Orr was posthumously inducted into the Rock and Roll Hall of Fame as a member of the Cars in 2018. Benjamin Orr was born in Lakewood, Ohio to parents of Polish, Russian, Czechoslovakian and German descent. His family actively supported his musical endeavors. He became proficient in several instruments including the guitar, bass guitar, keyboards, and drums. Known locally as "Benny 11-Letters," he grew up in Lakewood, Ohio, and Parma, Ohio, and attended Valley Forge High School before joining a local band the Grasshoppers as lead singer and guitarist in 1964. "Pink Champagne (and Red Roses)"
In 1965, the Grasshoppers released two singles on the Sunburst label, "Mod Socks" and "Pink Champagne (and Red Roses)", the latter written by Orzechowski. The Grasshoppers were also the house band on the Big 5 Show, a musical variety TV show produced by WEWS-TV in Cleveland. The Grasshoppers dissolved in 1966 when two of the band members were drafted into the U.S. Army, after which Orzechowski joined the band Mixed Emotions and later, the Colours. Later Orzechowski was drafted as well, although he received a deferment after approximately a year and a half in the Army. Orr first met Ric Ocasek, the future leader of the Cars, in Cleveland in the 1960s after Ocasek saw Orr performing with the Grasshoppers on the Big 5 Show. A few years later, Orr moved to Columbus, Ohio where he and Ocasek formed a musical partnership that would continue in various incarnations until the break-up of the Cars in 1988. After moving to Boston, the two formed a folk band called Milkwood with guitarist James Goodkind. In 1973, the group released one album, How's the Weather?, which failed to chart. Remaining in Boston, Ocasek and Orr then formed another band, Richard and the Rabbits, featuring keyboardist Greg Hawkes, followed by another band, Cap'n Swing, which included guitarist Elliot Easton. After the group broke up in 1976, the three of them along with Hawkes and drummer David Robinson formed the Cars. As a member of the Cars, Orr sang lead vocal on some of the band's best known songs, including their first top 40 hit "Just What I Needed", "Let's Go," and on "Drive", their highest-charting U.S. single. Orr released his only solo album, The Lace, in 1986. He co-wrote the music and lyrics with his long-time girlfriend, Diane Grey Page who also sang backing vocals, and the album had one top 40 hit, "Stay the Night". The song was a top 10 album rock hit and the video was in heavy rotation on MTV. A second single "Too Hot to Stop" was also released, but did not chart in the Billboard Hot 100 though it reached number #25 in the rock charts. The album cover for The Lace featured Orr on the front and Page on the back. Orr continued to work with the Cars for one more album, Door to Door, and tour before the group disbanded in 1988, after which he and the other members pursued solo work. Sometime in the mid-1990s, Orr recorded tracks with guitarist John Kalishes for an unreleased follow-up to The Lace. From 1998 until his death in 2000, he performed with his own band ORR and two side bands, "The Voices of Classic Rock" with Mickey Thomas and John Cafferty, and "Big People", which was a cover band with Pat Travers (of the Pat Travers Band), Jeff Carlisi (of 38 Special), Derek St. Holmes (of Ted Nugent), and Liberty DeVitto (of Billy Joel). In April 2000 Orr was diagnosed with pancreatic cancer and hospitalized; however, he continued to perform with the band Big People throughout that summer at music festivals and state fairs. He reunited with The Cars one last time in Atlanta, for an interview that was included in the Rhino Records concert video The Cars Live. His final public appearance was on September 27, 2000, in a Big People concert in Anchorage, Alaska. He died at home in Atlanta on October 4, aged 53, surrounded by fellow Big People band members Jeff Carlisi, Derek St. Holmes and Rob Wilson. Manager David Tedeschi was not present but was devastated by the loss of his best friend. Orr is survived by his son Ben. Ric Ocasek wrote and recorded the song "Silver," which was his musical tribute to Orr. It appeared on Ocasek's 2005 solo album, Nexterday. The Cars reunited ten years after Orr's death and released their seventh studio album Move Like This in May 2011. Orr was given special thanks in the liner notes: "Ben, your spirit was with us on this one." Orr is buried at St. Patrick's Cemetery in Thompson, Ohio. ^ "The Cars". Rock & Roll Hall of Fame. Retrieved December 17, 2017. ^ a b "Benjamin Orr - Biography & History - AllMusic". ^ "The Lace - Benjamin Orr - Credits - AllMusic". ^ "Rock musician Benjamin Orr dies". Spartanburg Herald-Journal. October 5, 2000. p. B2. Retrieved November 20, 2010. ^ "Voices of Classic Rock & Rockforever.com – Presents BEN ORR". March 24, 2008. Archived from the original on March 24, 2008. Retrieved November 21, 2010. ^ "The Cars' Benjamin Orr hospitalized". Mtv.com. May 24, 2000. Retrieved September 17, 2018. ^ Saidman, Sorelle (October 4, 2000). "MTV reports Benjamin Orr's death". Mtv.com. Retrieved July 18, 2011.